Thank you so much Joanne and Tom! It was a complete joy building your "beach theme" sunroom and working with such amazing clients. We appreciate the great feedback! Thank you Tania and Corbin! 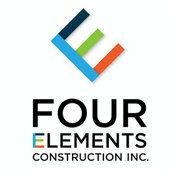 We hired Four Elements to renovate our main floor with emphasis on the kitchen and master bedroom ensuite. Thank you John and Anita!! Thank you so much Ann, we hope you enjoy your new custom shower and refinished ensuite. Thank you for being a great client, it was a joy to work for you!